In just five days, two teenagers had been subject to alligator attacks in Florida. Unfortunately, one of these two encounters had caused 17-year-old Kaleb Langdale his right arm. According to reports on the incident, the results could have been much worse if not for the quick thinking of the teenager and his friends. While his friends immediately called 911 for rescue, Kaleb had managed to swim away from the 11-foot alligator with his arm still inside the creature. To stem off the bleeding, Kaleb had squeezed his arm between his legs and applied spider webs to the wound. The authorities had managed to capture and kill the alligator behind the attack in order to retrieve Kaleb’s arm. Unfortunately, too much time had already elapsed since the attack, making reattachment of his limb impossible. The surgery to close Kaleb’s wound had meanwhile been successful and his family had started an online fundraising campaign in order to provide Kaleb with a prosthetic arm. When Do Alligator Attacks Tend to Occur? Studies show that the natural instincts of alligators tend to be more aggressive during the warmer months of the year. At this time, alligators have begun their mating season and, combined with the increase in their metabolisms, they also become more territorial and aggressive in their encounters with other species – including humans. In an interview, Kaleb says that watching the show Swamp People has helped him immediately think of ways to survive the attack as well as save himself from bleeding to death. 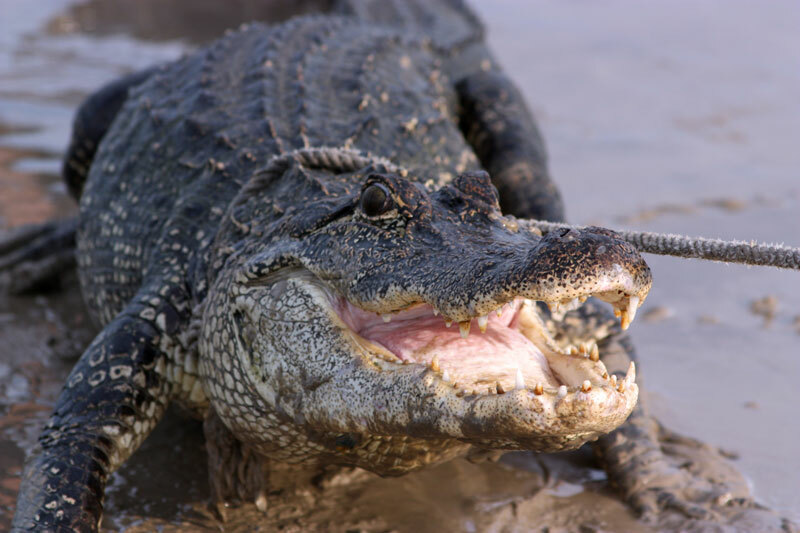 Information is definitely one of the keys to surviving alligator attacks, and having the right type of knowledge is especially essential when you live in an alligator-infested area like Florida. In 2011 alone, the state’s alligator nuisance hotline at 1-866-FWC-GATOR had received over 16,000 complaints and which resulted into approximately 7,000 alligators removed from populated areas. Prevention is still the best cure in alligator attacks, and this means doing your best to avoid alligator-infested areas. If this proves to be impossible, here are other things you can do to minimize dangerous encounters with alligators. * Alligators are more active after dark. If you need to frequent alligator-infested areas, try to do so during the daytime. Have as many people with you as well since alligators tend to avoid areas that are noisy and busy with human activities. * Pay very close attention to your surroundings as you will need all the time you can get to escape alligators. Their speed on land is about eleven miles per hour. Run away but do not run in different or twisting directions as this will only slow you down. * Avoid having small dogs with you in these areas as they closely resemble the type of animals that alligators commonly feed on. * If you are bitten by an alligator, you should not waste your time trying to pry its jaws open. The best you can do is to poke its eyes, make as much noise as possible, and struggle as hard as you can to get free.